There are eight species of carnivores (meat-eating mammals) found on Madagascar. Of these seven are endemic, or found nowhere else in the world. Madagascar's carnivores are all viverrids, a group of mammals that includes the mongoose. The most famous carnivore found in Madagascar is the fossa, which was featured as a "bad guy" in the movie MADAGASCAR!. In reality, fossa aren't bad. In fact, they play a key role in the health of Madagascar's ecosystems. The fossa is a carnivore that is related to the mongoose and looks like a cross between a puma and a dog. Fossas hunt almost any animal including insects, reptiles, rodents, and lemurs. They also prey on chickens in and around Malagasy villages and are hunted by local people as vermin. 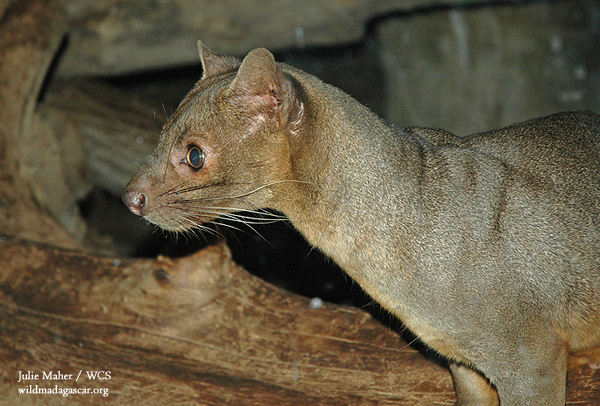 Fossa are active both in trees and on the ground and are excellent climbers.